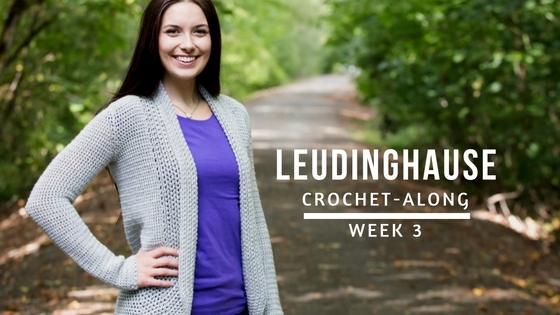 Welcome to Week 3 of the Leudinghause Crochet-Along! This week we will be working the trim. Are you lost? Read THIS POST first! I want to remind you the PDF is still available to purchase HERE if you’d like. Keep in mind, all the info you need is located below for FREE but if you’d like something to print the PDF may be something you’ll want to purchase. Here is a video explaining everything for this week. If you are looking for specific information I have noted at what times I start talking specific things in the post below. A big thanks to Universal Yarns and Furls Crochet for the supplies for this CAL! With right side facing join to the 1st ch-1 space of the back of the neck. (3:43) Round 1 (rs): Working across the back of the neck, Ch 1, (esc, ch 1) in each ch-1 space across the back of the neck. (5:18) Working down the front, [(esc, ch 1) in the end of the next 2 rows of the front, skip 1 row] down the front of the cardigan until 10 rows remain, (esc, ch 1) in the next 3 rows, place a sm in the last ch made, (esc, ch 1) in the next 5 rows, place a sm in the last ch made, (esc, ch 1) in the last 2 rows. (10:05) Working across the foundation row [(esc in the next, ch 1, skip 1) 3 times esc in the next, ch 1] across the bottom foundation row. (12:07) Working up the other side of the front, (esc, ch 1) in the next 3 rows, place a sm in the last ch made, (esc, ch 1) in the next 5 rows, place a sm in the last ch made, (esc, ch 1) in the next 2 rows, [(esc, ch 1) in the end of the next 2 rows of the front, skip 1 row] up the other side of the cardigan, join with a slip st to the first esc. Stitch count here is not crucial. (14:00) Round 2: Ch 1, turn, [(esc, ch 1) in each ch-1 space to 1 ch-1 space before the next sm, (esc, ch 1) 2 times in the marked ch-1 space, (esc, ch 1) in the next 2 ch-1 spaces, (esc, ch 1) 2 times in the next esc, place a sm in the 1st ch-1 space made in the last st, (esc, ch 1) in the next 2 ch-1 spaces, (esc, ch 1) 2 times in the next marked st] 2 times, (esc, ch 1) in each remaining ch-1 spaces, join with a slip st to the first esc. Move each remaining sm to the 1st ch-1 space made in the marked ch-1 space. (16:40)Round 3: Ch 1, turn, [(esc, ch 1) in each ch-1 space to 1 ch-1 space before the next sm, (esc, ch 1) 2 times in the marked ch-1 space] 3 times, Move each of the last 3 sm to the 1st ch-1 space made in the marked ch-1 space, (esc, ch 1) in each remaining ch-1 spaces, join with a slip st to the first esc. Move each of the last 3 sm to the ch-1 space BEFORE the marked st of the previous round. *Note: you will increase in the first 3 marked stitches ONLY. Repeat round 3 until you have 20 total rounds. Round 21: Ch 1, turn, (esc, ch 1) in every ch-1 space around, join with a slip st to the first esc. As you work the trim it should lay nice and flat. If for some reason you find the trim is wavy you can go down a hook size or if you find the trim is puckering you can go up a hook size. You’ll know within a couple round if you’re having any of these issues. It just means you chain too loose or too tight but is not a huge deal. If you need some help please hop into my Facebook group and there are some awesome people in there (including me!) ready to help.